the 80’s were so choice. whether it was new wave, hair metal, the cure, run DMC, miami vice or valley girls, the 80’s was a pure excess of awesomeness. and, let’s face it, so is riding your bike, right? ESPECIALLY in a huge BIKE PARTY! so dust off your best spandex and acid wash jordache, huge gold chains and high top pumps. 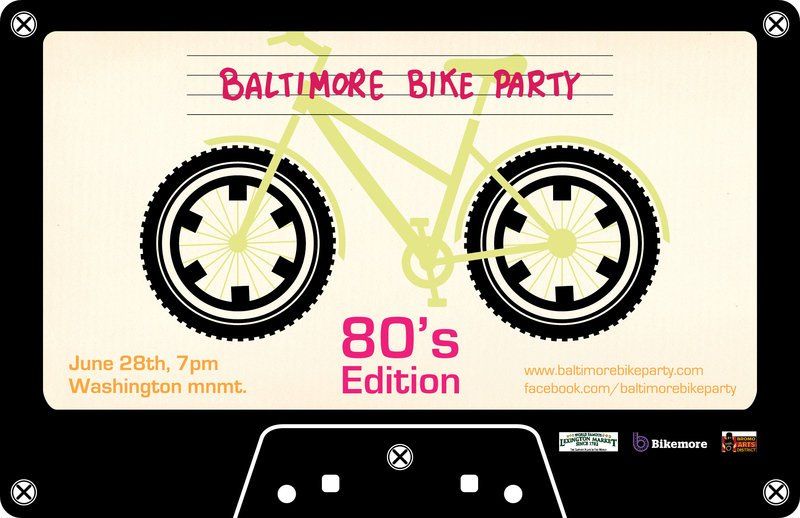 coif up your best flock of seagulls hair or side ponytail and come ride baltimore’s west side to a sweet 80’s track list with all your wicked homeboys and homegirls and get ready for some mad slamdancin at the red lights. this month we are working with the Bromo Tower A&E District and Downtown Westside, along with representatives of the westside communities to create an even stronger bond between the bike party and the neighborhoods it brings joy to, so stay tuned for extra awesomeness! meet at the monument at 7pm and roll out at 7:30.
the after party this month will be at Lexington Market with food from Faidley’s Seafood, Mexican Delight, Mem Sahib, and more! there will, as always be beer and DJ Ro to keep the party jumping. this month there will also be an AFTER after party (oh snap) at Alewife! 2 Responses to June 80’s Ride! WILL THERE BE WHAM! ON THE JUKEBOX?? ?